The KNIGHT is the perfect fit for all users desiring more space as it's the largest of the range. This industrial strength chair offers a greater level of support for your entire frame and head with it's taller backrest and wider seat base. The KNIGHT is the perfect fit for all users desiring more space as it's the largest of the range. 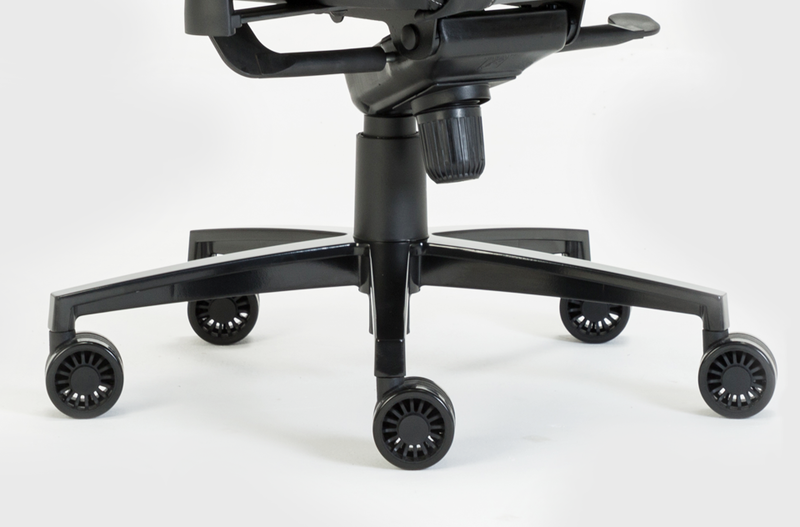 This industrial strength chair offers a greater level of support for your entire frame and head with it's taller backrest and wider seat base. The additional lumbar back support adjustment knob just adds to the comfort! Like it's little brother, the DIABLO, the KNIGHT comes with firmer and thicker (cold-cure foam) cushioning to give the greatest amount of comfort for long periods of use. The XL 75mm PU wheel casters provide smooth gliding as well as increased durability and sturdiness. 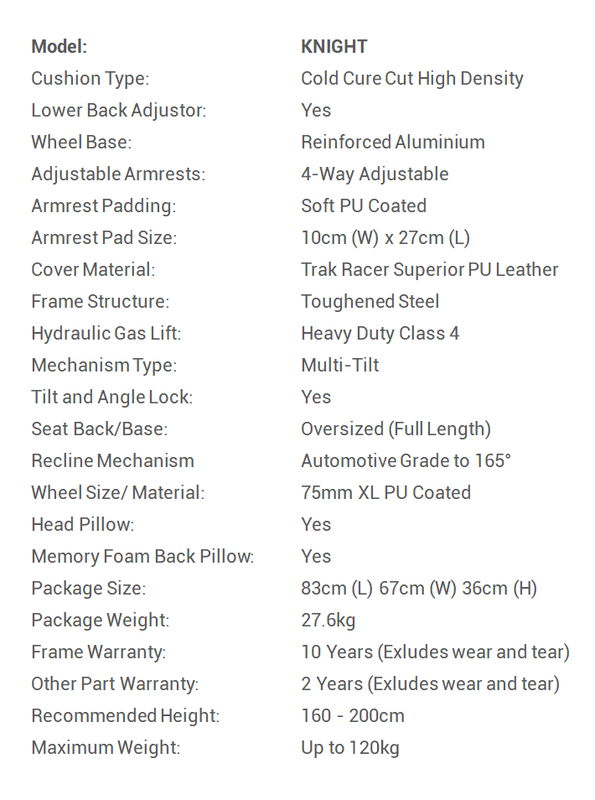 The included head pillow and memory foam lower back lumbar pillow are a bonus! 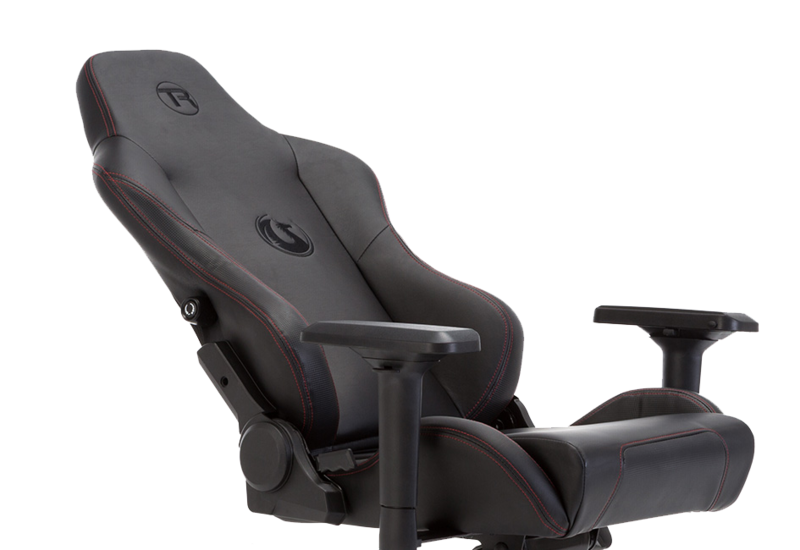 The KNIGHT features integrated lower-back lumbar support adjustment which will allow you to quickly adjust the lumbar support in your chair for added comfort. The KNIGHT is the largest in the range from Trak Racer and features a wider seat base and taller backrest, the KNIGHT is suitable for a greater range of body sizes as it wraps itself around most people for the best ergonomics. The large size combined with Superior PU Leather and thicker layer of cold-cure foam makes the KNIGHT the most comfortable among the competition. 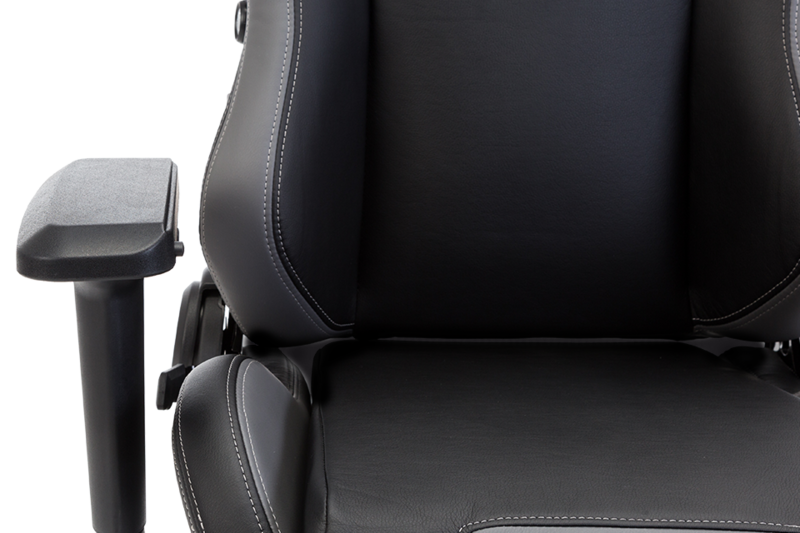 With premium quality automotive-grade hinges, the KNIGHT will allow you to comfortably recline to an almost flat position. The perfect answer to a mid-day siesta! With an even larger backrest than it’s competition, the KNIGHT is perfect for the small, tall and large up to 200cm in height. 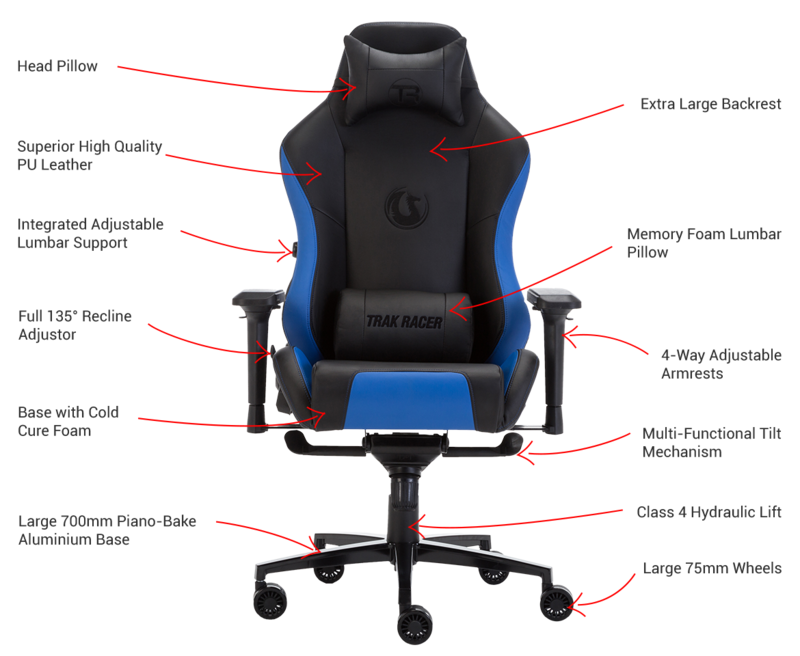 All Trak Racer Chairs have been designed and engineered in collaboration with Professional eSports Players who demand a chair that will provide the greatest level of support during extended play sessions. 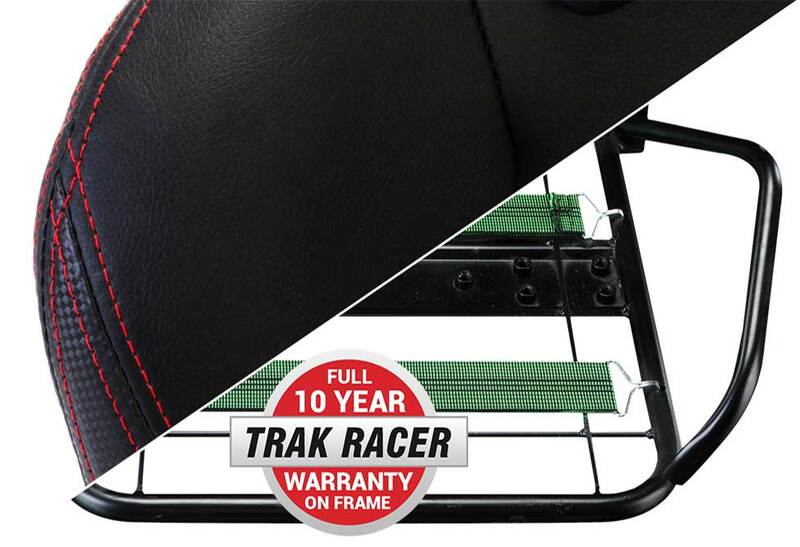 Trak Racer chair’s have a backrest that naturally adapts to the shape of the spine therefore providing greater comfort while easing pressure. The multi-functional, height-adjustable butterfly tilt mechanism provides the KNIGHT with suspension-like comfort and full control of stability, adjustment and support. 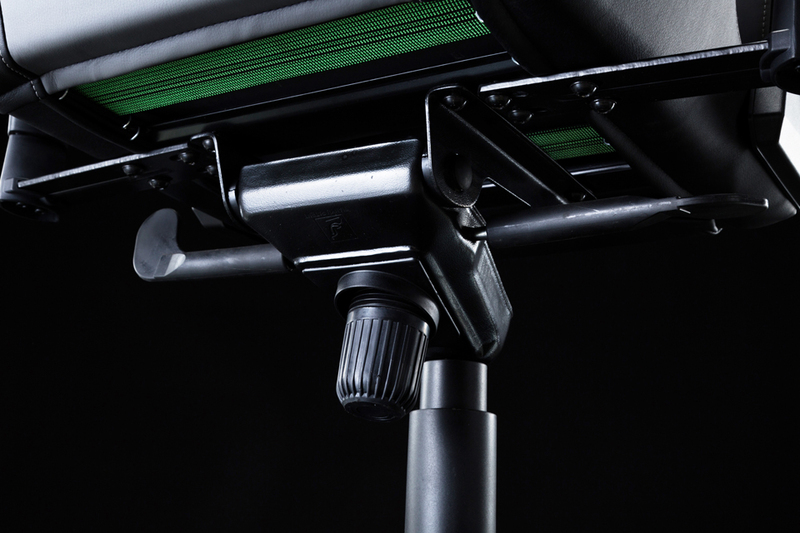 With it’s independent tilt mechanism, this high-end seat mechanism allows you to lock the chair while in a tilt position as well as tilted backwards while the backrest is upright. The extra large armrests provide adjustability which provides the perfect configuration for every user. Adjust the armrests from Left to Right, Angled to the Left or Right, Forward or Back and Up or Down to find the most comfortable position for yourself. 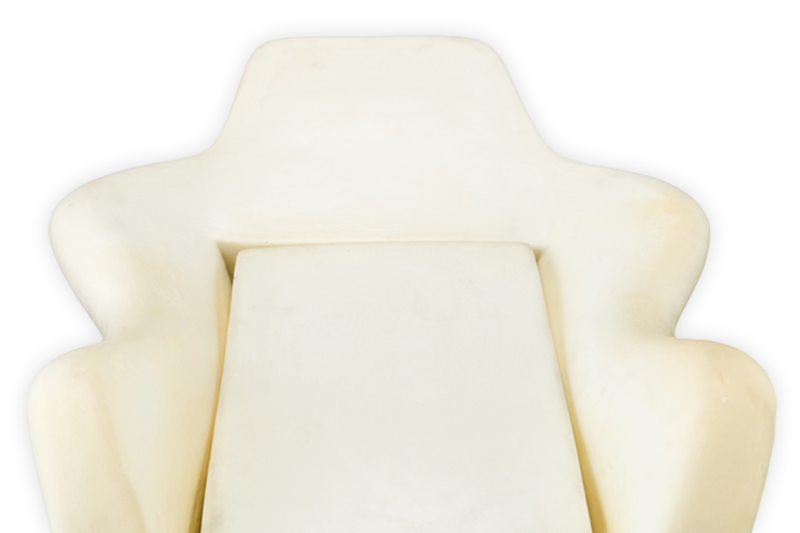 The inner workings of the KNIGHT incorporate the use of only top class materials to provide comfort and reliability. 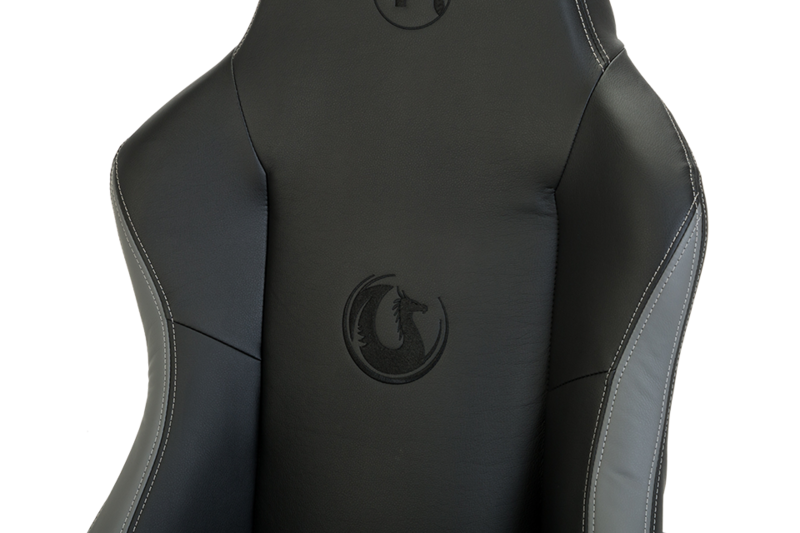 The SUPERIOR PU Leather incorporated into every Trak Racer Game chair to chair of the highest grade which is durable, soft, flexible and waterproof. Beneath the SUPERIOR PU Leather is a carefully designed and constructed steel frame. Each component in the KNIGHT has been specifically chosen for DURABILITY, COMFORT AND QUALITY. 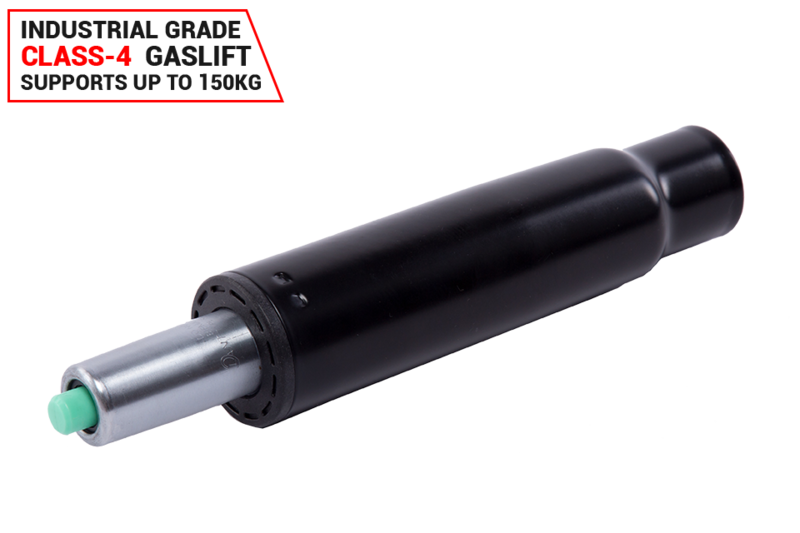 All this is backed by Trak Racer’s 10 Year Frame Warranty and 2 Years Warranty on all other parts. 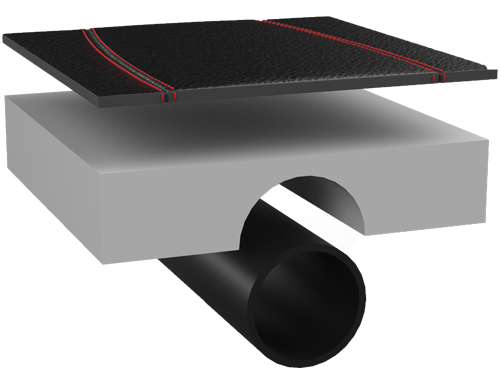 The Large 700mm Piano-Bake base made from light and tough Aluminium is resistant to corrosion, rust, and equipped with 5 Large 75mm Wheels made from nylon and coated in polyurethane to allow simple and silent gliding across all types of surfaces. 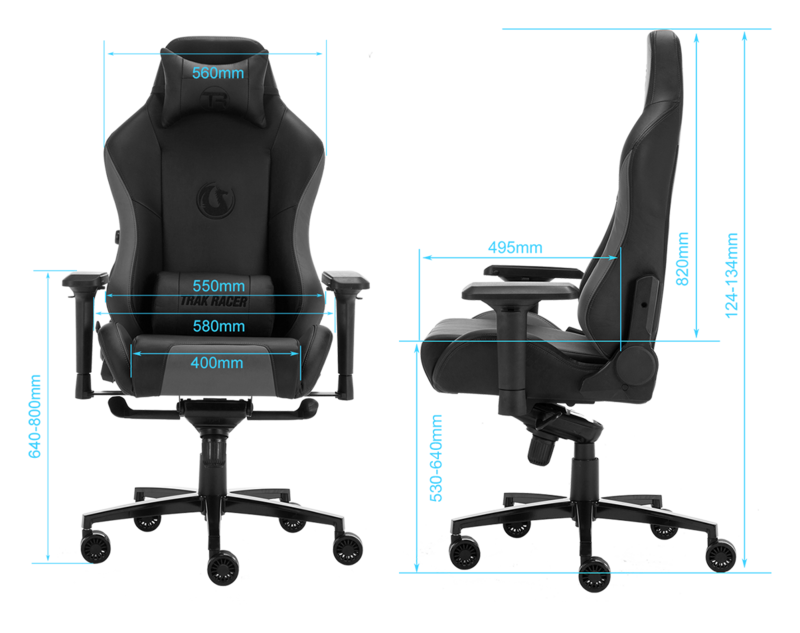 With a maximum weight of 150kg (330lbs), Trak Racer Office Chairs are suitable for a wide range of users. 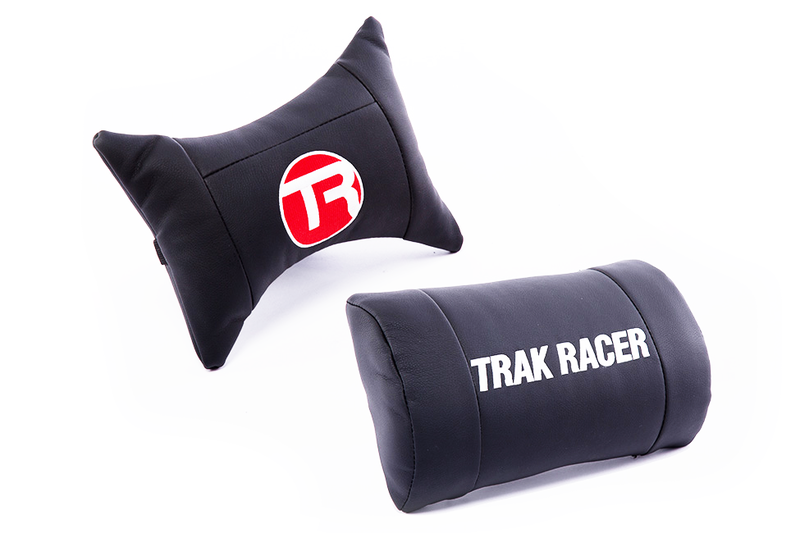 Trak Racer seats include two specially-designed lower back and head pillows. The large lower back support pillow is made from high quality memory foam which moulds to the shape of you while the head pillow is made from a softer inner material. Both pillows are covered with the same high quality washable Faux Leather PU as the chair. 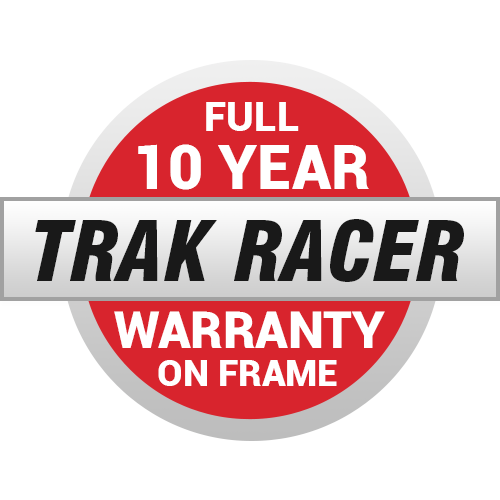 Since 2008, Trak Racer has primarily been evolving a range of high-end sim racing cockpits with an emphasis on Style, Function, Adjustability, Durability and Comfort. With an extensive 10+ year history of experience, we have used our knowledge to design and engineer a range of Chairs with the best materials and manufacturing processes available; introducing the DIABLO & KNIGHT Series Chair Range. 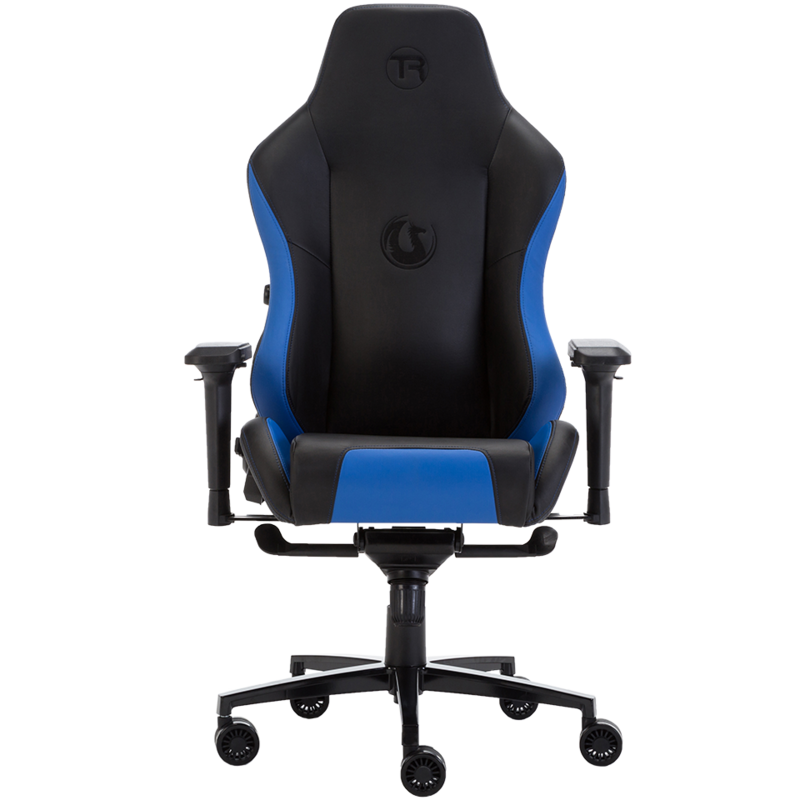 Trak Racer KNIGHT Premium Gaming Chair - Superior PU Leather in Black/Blue has a rating of 0/5 based on 0 reviews.